He wasn’t high born. He was a farmer from Origgio, Italy. And he could run, and run, and run – Forrest Gump-style. 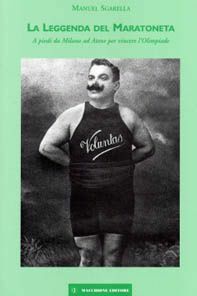 In the 1890’s, Carlo Airoldi was one of the best long-distance runners in Europe. In 1895, the year before the inaugural Olympics in Athens, Airoldi won the Milano-Barcelona footrace, a 12-leg competition of 1,050 kilometers! So when Airoldi heard about the Athens Olympics, he likely thought a 42-kilometer marathon would not be a problem at all. Unfortunately, there was another problem. He was not a man of means like the majority of athletes attending the Athens Olympics. He could not afford to take trains or ships from Italy to Greece. So he decided to walk. Two thousand kilometers. So that he could run 42. He convinced an Italian magazine, La Bicicletta, to sponsor his expenses in exchange for his story. He figured if he walked and jogged some 70 kilometers a day, he could make it to Athens in a month. So, according to this article in Italian, he departed Milan on February 28, 1896, taking his first steps in the cold and windy winter weather. The book, The Olympics: A Very Peculiar History, explains that after making it 700 kilometers to Ragusa, Yugosloavia, Airoldi bought a ticket for a boat to Pattras in Western Greece, before walking another 200 kilometers to Athens. It took Airoldi a little over a month, but he made it! Not quite the build you’d expect of a marathon runner…. Airoldi arrived in the Greek capital in early April, just in time for the start of the Olympic Games. Unfortunately for him, these weren’t the Games of the ancient Greeks. These were the Games of Baron Pierre de Coubertin, who believed in the purity of amateur athletics, that only those who were not tainted by victory prizes were allowed to compete. When asked by members of the organizing committee whether he have ever received money in a competition, Airoldi replied sincerely that he indeed had, the previous year, after winning the Milan-Barcelona race a year before. Perhaps, as the Italian article explains, there was also concern that this renown distance runner from Italy was a threat to the favored Greeks in the marathon. Whatever the reason, a shocked Airoldi was declined eligibility to run in the marathon. “If only they could walk a mile in my shoes…,” he may have thought. Posted in Other Olympics, Pop Culture, Track and FIeld and tagged 1896 Athens Olympics, amateurism, Carlo Airoldi, Italy, marathon, Milano-Barcelona race. Bookmark the permalink.